SCAR is charged with initiating, developing and coordinating high quality international scientific research in the Antarctic region, and advising on the role of the Antarctic region in the Earth system. The scientific business of SCAR is conducted by its Standing Scientific Groups in the Physical-, Life- and Geo- Sciences which represent the scientific disciplines active in Antarctic research. These groups share information on disciplinary scientific research being conducted by national Antarctic programmes; identify research areas or fields where current research is lacking; coordinate proposals for future research by national Antarctic programmes to achieve maximum scientific and logistical effectiveness; identify research areas or fields that might be best investigated by a major SCAR Scientific Research Programme; and establish Action and Expert Groups to address specific research topics within the discipline. SCAR related research data is highly multidisciplinary and disparate. This policy aims to provide a framework for these data to be handled in a consistent manner, and to strike a balance between the rights of investigators and the need for widespread access through the free and unrestricted sharing and exchange of both data and metadata. This policy is compatible with the data principles of SCAR’s parent body, ICSU and other relevant international agencies (e.g. WMO), and with the goals of Article III 1 c of the Antarctic Treaty. Since SCAR coordinates a distributed programme of research, generally implemented through a number of nationally self-managed projects, the principles enshrined in this Data Policy should be applied to data in each SCAR-endorsed Project. 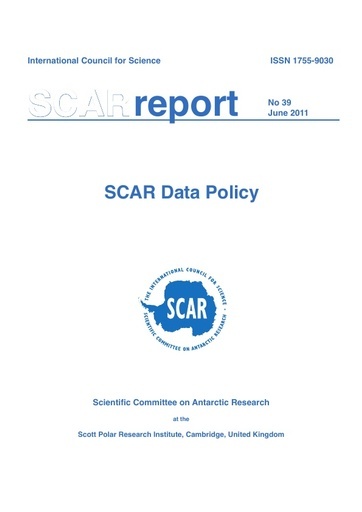 In order to be considered part of a SCAR Research Programme, each Project should follow the SCAR Data Policy, submit metadata and linked datasets to the Antarctic Master Directory (AMD - gcmd.gsfc.nasa.gov/Data/portals/amd/) in a reasonable timeframe, and should have an appropriately funded data management plan in place before the Project begins. Nations affiliated with SCAR are urged to establish a National Antarctic Data Centre (NADC) or assign NADC responsibilities to an existing national institution capable of carrying out NADC obligations. NADCs in collaboration with SCAR Research Projects and Programmes will work towards developing a SCAR Antarctic Data and Information System (ADMS). The SCAR Standing Committee on Antarctic Data Management (SCADM) is responsible for this Data Policy. Questions about the policy and its implementation should be directed to the SCADM Executive.